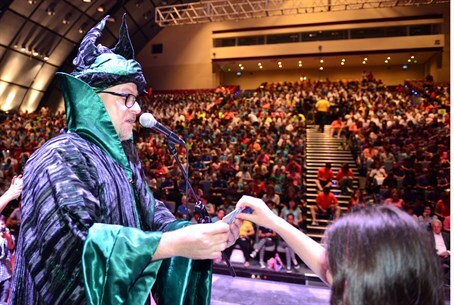 Cagliostro hosts 'Haifa Magic for Peace,' world's largest ever magic lesson, to 1,573 students of various ethnic backgrounds in Haifa. Israeli magician Cagliostro succeeded in breaking a Guinness World Record on Monday, when he held the world's largest ever magic lesson. Attending the lesson at Haifa's international conference were 1,573 children aged 10-11 from twenty-five schools across Haifa. Jewish, Muslim, Christian, Bahai and Druze children were all included. The event, dubbed "Haifa Magic for Peace," was sponsored by Beit Hagefen, a cultural center that works to foster dialogue and coexistence between Jewish and Arab residents of Israel's third largest city. The lesson began with Cagliostro teaching the students a card trick with a specially prepared pack of eight cards that had words like "Peace," "Coexistence" and "Dialogue" written on them. Each child asked a friend to pick a card and then place it back in the pack, after which the children would make the chosen card rise above the rest with a magic wand. To conclude the lesson, all of the children performed the trick in unison, while uttering "Peace Be With You" in both Hebrew and Arabic. In attendance was Haifa's Mayor, Yoni Yahav, who stressed the vitalness of the event breaking the Guinness World Record. Cagliostro also emphasized how important the magic lesson was, noting "this is a magic lesson with representatives of every faith and community in Haifa, this is Haifa Magic for Peace." "It wasn’t just about teaching a trick or breaking a record, it was about bringing people together to speak and get to know each other." "I hope that each and every one of these children will show the trick to at least 30 of their friends and family, taking the message of peace and understanding to over 50,000 people, because at the end of the day, peace is in our hands,” the magician added.